A couple of months ago Southern Living posted 10 or 12 soup recipes that we all should have in our freezer when we don’t have time to cook or we just don’t feel like it. Then like magic we can just pull it out and presto dinner is served. I have started cooking them now that the temperature is cooler. Ha! It was 80 on Christmas , but I am a soup lover no matter what season of the year and no matter what the temperature is outside. I have made this particular soup 4 times and it has not made it to my freezer yet! We love it! It is full of flavor and packed with some really good stuff. I guess I’m going to be forced to go out and buy a larger pan so that I can double the recipe. I think that will be the only way to have some of this good stuff land in my freezer. Paris we are with you! The weather is getting cooler so you’re going to need some new soup recipes to pull out and this one is a winner. I really mean that it is an A+ guaranteed to knock your socks off recipe! I had something like this in Carrollton at Highlands Deli and could not stop thinking about then lo and behold Kathy from Noble Pig posted this recipe. It is to die for. I have made it at least 5 times and slurped it all up by myself. Delish! I can count the number of times on one hand that I’ve cooked or eaten butternut squash. Someone should have introduced me to this jewel of a soup a long time ago. I will be making this many times! It’s amazing both hot or cold. It’s restaurant good. Sonja one of my fellow teachers, loves to cook. She and I share recipes and this is one of hers. I knew it was a hit when her son brought a cup of it to school for his girlfriend to taste. When does that ever happen? I woke up this morning and found snow on my deck. That’s just wrong for March. Isn’t spring just around the corner? 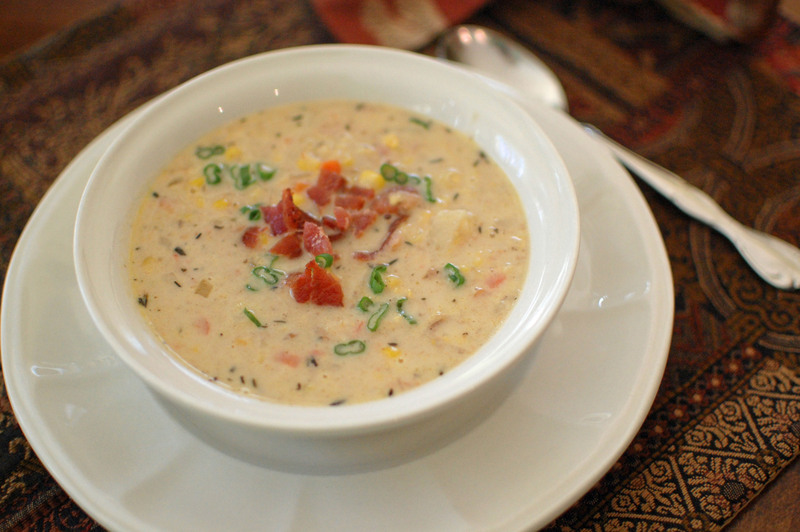 Well, anyway it is a good excuse to make this wonderful corn chowder from Katie Workman. I just love this cookbook that I purchased at our school book fair this year. It is filled with easy and scrumptious recipes that the whole family will enjoy. Even if you’ve got some picky eaters in your midst she handles that, too. Never in a million years would I have made this soup except for the fact that a huge bag of kale arrived in my CSA box. I’ve cooked kale before, but I have never had results like this. I just cannot gush enough about this soup! I am just loving the collection of recipes in Gourmet Quick Kitchen. I have not been disappointed in any of the recipes so far! And this is one of the best soups ever! Start to finish it takes 45 minutes and that includes removing the ribs from a pound of kale. But, it has one small catch. Don’t plan to serve it until the next day. The flavors need 24 hours to come together. This broth has a surprising amount of depth to it especially considering the small number of ingredients. It’s close to a French onion without the beef broth. In fact, water is the only liquid. 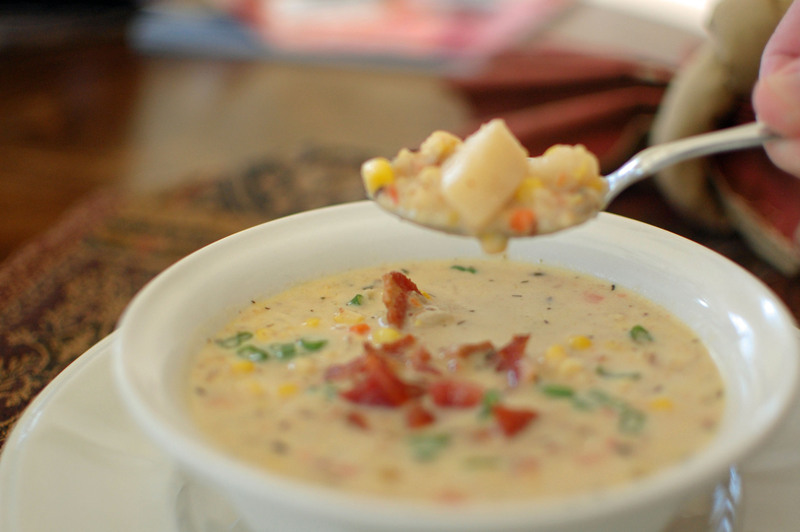 It doesn’t have to be a cold, rainy or snowy day for me to love a hot bowl of soup. I love soup on any day anytime! With much skepticism I made this soup not really expecting the flavor that it produces. Using packaged taco seasoning, ranch dressing, and two kinds of olives you have to admit that it is a wild combination. But, it works and it works quite well. I love potatoes, bacon, and cheese. I love my slow cooker, too! Together this is one of my favorite soups. It literally fell in my mailbox in 1993. It was in one of those magazines they send to everyone. You know one of those that they want you to subscribe to for the rest of your life. And I fall for that kind of marketing every time especially when the recipes look so good! Since 1993 this magazine has grown in popularity, but for me the premiere issue brought to me the best and easiest potato soup ever. 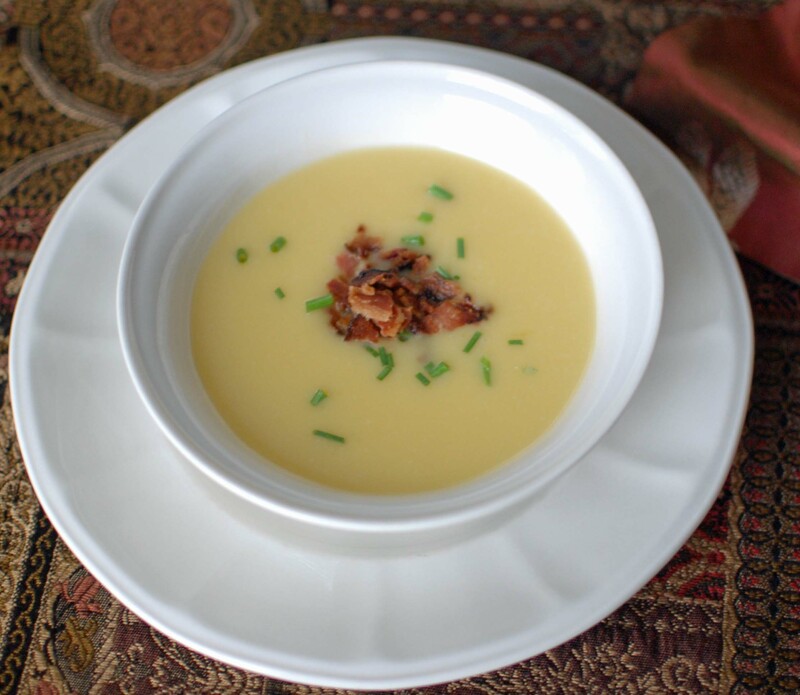 Dotty Egge from Minnesota submitted her recipe for No Fuss Potato Soup to Taste of Home and it has been served at my table literally hundreds of times. I love coming home from work and opening the door to the aroma of this soup, especially if it is a brisk day. It just hits the spot.